There were over a dozen of press conferences at Gamescom but as we're not a games site pur sang we only focused on the hardware related events. First up was the Republic of Gamers press event from ASUS, fortunately the girls were pretty and the food was good because the actual press event was a bit of a letdown because we didn't get to see anything special. The first part of the conference was all history, about the overclocking innovations made over the last ten years and a look at some golden oldies like the ASUS P2B, P2B-F and P3B-F motherboards. These motherboards were shown off by two pretty ASUS promo girls and because someone in the audience wanted to take a closer look they started passing them around. As if we really came to this conference to see ten-year old motherboards. 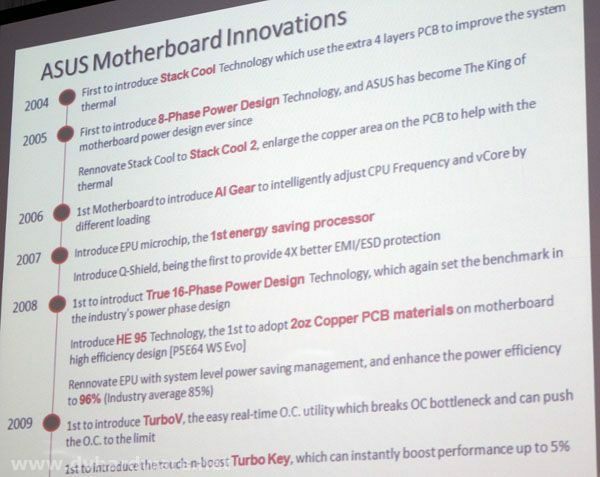 The slide below shows some of the motherboard innovations ASUS made over the last five years, afterwards the presenter talked about some of the new overclocking features of ASUS' upcoming P55 motherboard series. Some new motherboards like the Rampage II Extreme, Maximus II Gene and Maximus III Formula were shown at the ESL Intel ASUS gamezone at Gamescom. 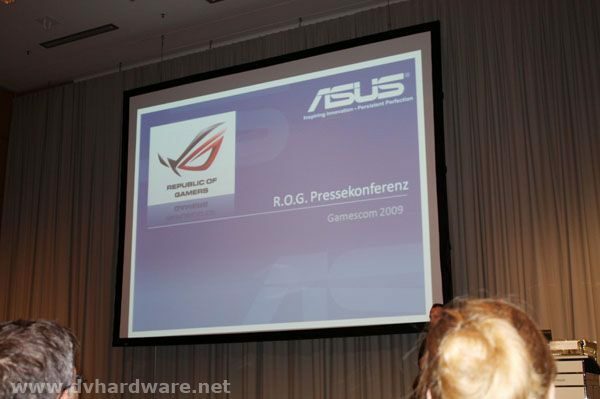 Then they showed off the ASUS G60 and G71GX gaming notebooks, both aren't really new though but ASUS had a Gamescom special on the G71GX-7S022K model. 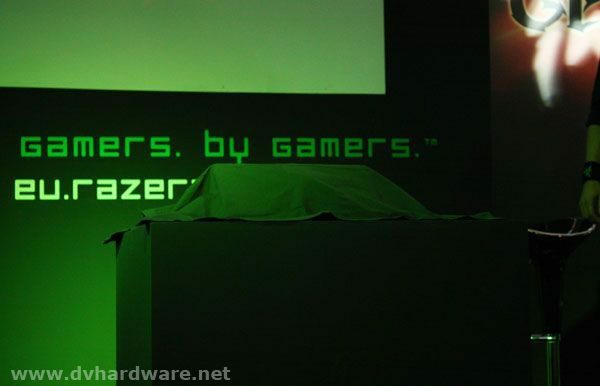 By the end of the press event ASUS talked about the benefits of the upcoming ASUS MARS, which promises to be up to 23 percent faster than a standard GeForce GTX 295. Funnily enough the black-haired ASUS girl only had a box to showcase, the actual MARS card was located behind glass at the ESL Intel ASUS gamezone. 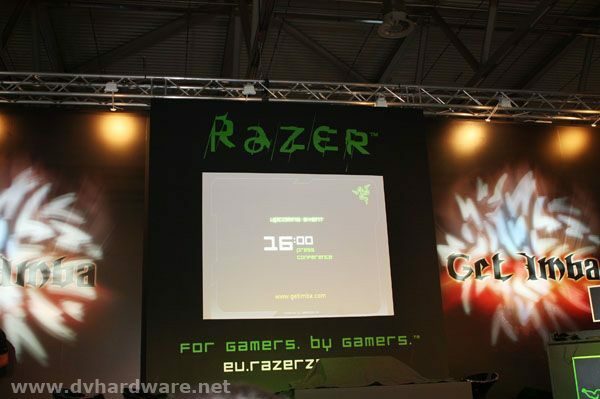 Click on the link to learn a bit more about this 1099EUR graphics card. 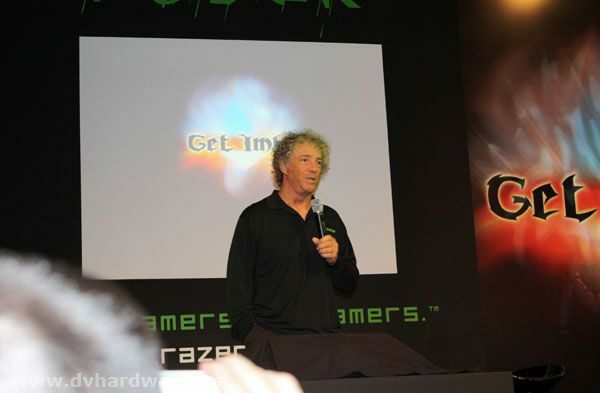 Afterwards we headed to the Get Imba press event from Razer where we got to see the latest gaming gear from Razer. and after a little dance by the two boothbabes the veil was removed and we all got a first look at the Razer Naga and the Razer Megasoma. The Megasoma is a new white gaming surface, it's a hybrid between a hard and soft gaming mousepad. The Naga on the other hand is a bit more special, this mouse was specifically designed for MMO gamers and features an overwhelming amount of buttons. The Razer Naga has a total of 17 buttons, with 12 of them located on the thumb grid on the left to quickly perform spells or other actions. You can find some hands-on photos over here. A female Razer employee demonstrated the Naga in World of Warcraft, and afterwards there was a Q&A session with Krakoff.